Street begging in Sweden – what to do about it? Did you know that Sweden is one of the few countries in the EU where begging is not illegal? A so-called ‘begging crackdown’ came into force in 2011 which criminalized the activity. 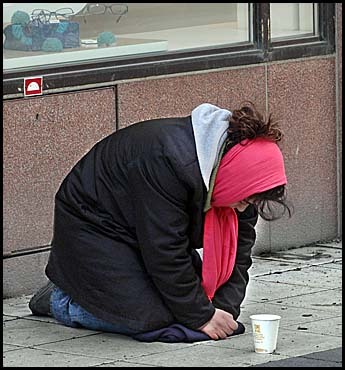 Beggars on the streets of Swedish towns are becoming more and more common and I, amongst others, have a difficult time deciding what to think about this. On the one hand, we’ve all heard about the gangs of beggars and the organization of donation gathering as a source of income for the gang leaders. On the other hand, there is the individual person sitting on the street freezing in the November rain. So, it’s all about each of us making a choice. Do we want to look at the global perspective, in which the individual often gets lost? Or do we want to look at the local perspective, and understand that what we choose to do, or not to do, can have an impact on another person’s life? Giving that money no doubt made him feel good, the criminal behind the begging no doubt was happy, a win-win situation ! !